Everton scored three first-half goals as they made it six successive home wins to step up their bid for Europe. James McFadden's 20-yard drive put Everton ahead after 14 minutes. Steve Davis and Gabriel Agbonlahor had efforts cleared off the line before Tim Cahill scrambled home a second and Leon Osman added a third right on half-time. Agbonlahor pulled one back for Villa on his senior debut after 63 minutes, but McFadden's back-heel set up Cahill for his second with a minute to go. Youngster Agbonlahor got his chance for Villa with Milan Baros, Kevin Phillips and Juan Pablo Angel all out. But he had few chances to make an impact in a nightmare first 45 minutes for David O'Leary's side. Everton went ahead after 14 minutes when James Beattie headed down Alan Stubbs' free-kick for McFadden to send a low, right-foot finish past Thomas Sorensen from 20 yards. Villa responded well and forced three goal-line clearances from Everton in the space of seconds as they went in search of the equaliser. Davis' shot was scrambled away by Gary Naysmith and from the resulting corner he was again on hand to clear Agbonlahor's header - but the danger was not over and Cahill was forced to head Davis' shot over the top. Villa paid the price as Everton doubled their lead after 22 minutes, with the visitors guilty of more woeful defending. 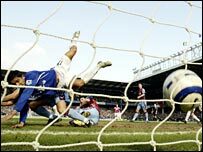 Phil Neville's throw was flicked on by Beattie and when McFadden's shot rebounded off an upright, Cahill beat Wilfred Bouma to the loose ball to score. Bouma was injured in the clash and he went off to receive stitches in a head wound. Villa were also forced to substitute virus victim Aaron Hughes with Jlloyd Samuel. Everton added a third on the stroke of half-time to complete a satisfactory first half for the in-form Merseysiders. Cahill's pass released Mikel Arteta and he easily beat Samuel before crossing for Osman to turn in at the far post. The Australian midfield man then headed narrowly wide before Villa mounted a spirited recovery. Villa deservedly grabbed a goal back after 63 minutes when Agbonlahor beat Richard Wright from a tight angle, with the Everton keeper guilty of letting the ball through his hands. Everton struggled to create chances after the break but they settled any nerves in the closing seconds when McFadden's clever flick set up Cahill, who hammered home the fourth goal past Sorensen. "James Beattie's all-round game was excellent. "He made goals, helped lead the line and put them under pressure all the time. He is playing well just now. "The players are playing well at the moment and if they keep doing that then they shouldn't fear anyone right now." "We are conceding too many easy goals from long balls. No matter how well you are playing, if you are doing that, you are giving yourselves a mountain to climb in every game. "Nobody is safe until you get the 40 points plus and we have got to gather them up." On Villa fans chanting against him, he added: "It comes to us all and we have got to get on with it. I'm trying to do the best with all I have got and I'll continue to do that." Everton: Wright, Hibbert, Weir, Stubbs, Naysmith, Osman, Neville, Cahill, Arteta (Kilbane 56), Beattie, McFadden. Subs Not Used: Westerveld, Yobo, Davies, Van der Meyde. Goals: McFadden 16, Cahill 22, Osman 45, Cahill 90. Aston Villa: Sorensen, Hughes (Samuel 29), Mellberg, Ridgewell, Bouma, Gardner (Hendrie 57), Davis, McCann, Barry, Moore, Agbonlahor. Subs Not Used: Taylor, Djemba-Djemba, Whittingham.